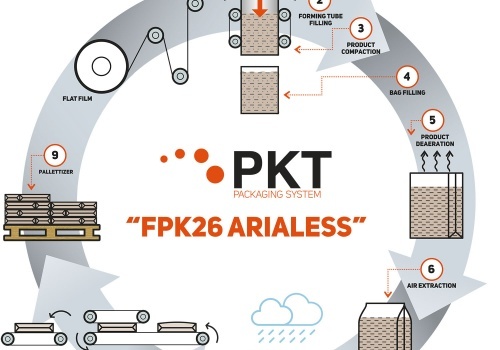 The new FPK 26 ARIALESS is the technological synthesis of packing of aerated, fluid and powdered products. This machine remains faithful to the philosophy of the flat reel film, whilst at the same time combining a rotatory cycle system for improved performance and efficiency. These steps automatically take place over 4 fixed stations. However, the rotatory system can also be provided with two or four palletising stations depending on production requirements. The footprint of the machine is very compact and the Single frame construction simplifies cleaning and maintenance procedures. PKT is meeting more and more customer needs with this packaging solution thanks to its simplicity, performance, reliability and protection offered to products. An economic investment with a fast payback.